NATICK, Mass. 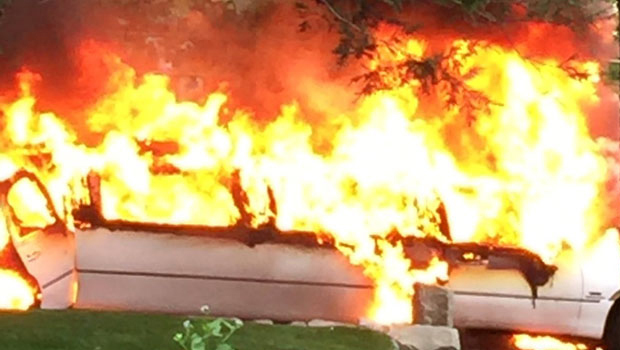 -- A limousine on the way to a high school prom burst into flames in Massachusetts Friday night, CBS Boston reports. Ten teens were headed to the Natick High School prom when flames started shooting from the passenger seat of the limo. "It started to get really big, and it looked like it was going to explode," student Alexander Goudsmit said. The driver told CBS Boston station WBZ-TV he tried to put the fire out with his suit jacket as his passengers ran to safety. The teens were able to catch a ride to prom with another group of students in a trolley. "It is a happy occasion," Alexander's father Tammo Goudsmit said. "I mean, let's clarify, nothing horrific happened, so thank goodness. They're going to be at the prom, and they're going to have quite the story to tell."